Better is an entertaining compilation of writings about different facets of medicine, I picked up this book and finished it during one travel day. Atul Gawande, a surgeon at Brigham's Hospital in Boston, weaves individual patient's stories with his thoughts about larger issues facing society. The stories remind us that medicine, given all of its dimensions, may be the most "human" of all endeavors. I am not related to any doctors, I don't have any friends in the medical field, and I see my own doctor as infrequently as possible. Meanwhile, 15% of our economy is based on medicine and health care. This book was a peek into that world for me, showing how engulfing it is, occupied by deeply dedicated professionals who are barraged by emotional, intellectual and physical challenges as part of their commitment to others' health. Gawande maps out his book in the Introduction. He says that there are three core requirements for success in medicine, around which he organizes his book: diligence, doing right and ingenuity. In the section on diligence Gawande talks about the effort to encourage doctors and nurses to wash their hands to stop the spread of superbugs, the diligence of doctors on the battlefield in Iraq (many soldiers' lives are saved that would have been lost before,) and lastly, the effort to rid polio from the earth, how complicated and human that effort is in its problems and issues. In the chapters on ingenuity Gawande talks about how medical centers can implement systems which improve survival. He describes in detail how a couple medical centers (and, arguably, due to the influence of a couple people in particular) are responsible for the life expectancy of cystic fybrosis patients now being up to age 45+, when in the 1960's the average patient could expect to live to age 3. For me, reading this book was like meeting a captivating guest at a dinner party who offered me a glance into a deep, engaging, world. I came away thankful for the author and others in medicine for their commitment to a tough field in which they make meaningful differences in people's lives and well-being (and, therefore, happiness.) I know that people in medicine are as human as everyone else, and that there are people in medicine who abuse power, are greedy, etc, just as in every other field. But I think, for the most part, people enter and stay in medicine for noble reasons. This book is about those people, whom I can only admire and appreciate. I'm getting his other book! A very human view of the great and the not-so-good aspects of doctors and doctoring. This was well-written, informative and enjoyable. It was nice to read about doctors doing it against the odds in real life and the practical obstacles in their way. I'd read the cystic fibrosis and c-section articles, and while the first was interesting, the second was an appalling disappointment for me, as I, like just about everyone else, really enjoyed _Complications_. While Gawande still has interesting things to say, his conclusions have become simplistic and seem at odds with the stories he tells in the course of each discussion. This was particularly apparent, as another reviewer has already noted, in the essay on the death penalty. In general, I got the sense he is papering over some very, very serious concerns with medicine as he is accustomed to practicing it. He gives slight recognition to the possibility of _not_ deploying every piece of technology available and describes glowingly, for example, the treatment of very low birth weight babies and inaccurately characterizes the value of the current system of treatment (never mentioning the greater success of kangaroo care elsewhere) both in terms of immediate preservation of life and in terms of long term quality of life. At a time when comments on U.S. health care are loaded with inflammatory speech and defensive posturing, Gawande offers us a refreshing, moderate, and reflective look at modern health care delivery. Using his journalistic/investigative approach to answering questions, Gawande puzzles through current issues in medicine. His candid presentation helps to strip away the reader's preconceptions. My father was a surgeon, so when my wife checked "Better: A Surgeon's Notes on Performance," by Atul Gawande, out of the library, I decided to open it and see if it was worth a read. Happily, it was absorbing reading! In spite of the title, it was not a collection of stories of successful heroic surgeries, but a series of essays on widely varying medical topics dealing with decision-making in the absence of complete data, morality, ethics, doctor-patient interaction, etc. 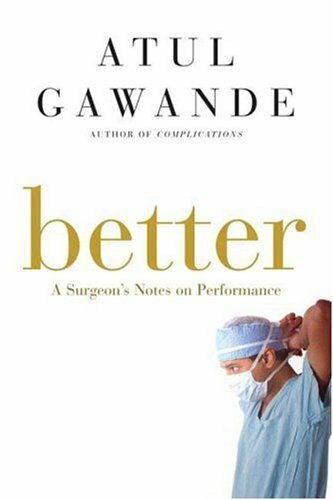 Dr. Gawande deals with real-life issues that possibly could confront any member of the healing professions--supervising lethal injections of convicts, for example--in spare, straightforward prose packed with well-researched statistics, extensive interviews with doctors and nurses, and exposure to all sides of the issues. Although I paced myself, reading one chapter a day, I could have finished the book in a few hours, as it was interesting and written in down-to-earth terms. Perhaps the greatest value of this book is the emphasis on performance measurement--"benchmarking," if you like. Dr. Gawande's research into treatment of diseases like cystic fibrosis, for example, revealed that the most successful treatment centers (1) kept detailed records of treatments, (2) were eager to try any seemingly logical approach, and (3) learned quickly from their successes and failures. Atul Gawande's collection of essays reflect on medicine in an amazingly even-handed way, considering the author is a surgeon. Rather than a defense of medical care, the author explores several controversial issues affecting health care and manages to not only see the various aspects of each issue, but to examine them in such a way the reader's mind is opened. Divided into 3 main sections, each a virtue that contributes to the development of modern medicine: diligence, doing right, and ingenuity. I was grabbed immediately by the first chapter regarding hand washing. Yes, hand washing! As an obsessive hand washer myself, I found the statistics regarding health care professionals and hand washing to be astonishing! And in the face of overwhelming evidence favoring hand washing, its pretty amazing that everyone is not donning exam gloves for everyday tasks. On the contrary, the cavalier attitude demonstrated by doctors and nurses towards hand washing would make a great psychology study. But luckily for us, there are people out there that not only appreciate the value of frequent washing, but took the extra step to figure out how to make it happen. I must apologize for not making this sound more interesting, because it truly is. While I found every chapter fascinating, I was particularly intrigued by the study of cystic fibrosis centers, and the description of medical care in India. In each chapter, we meet people who use their knowledge and skills to BE better. I especially appreciate Gawande's advice on becoming better, a 5 step program for improvement, or how to be a positive deviant. 1. Ask an unscripted question. 2. Don't complain. 3. Count something. 4. Write something. 5. Change. When are our efforts enough? Why do we always have to be better? Because we have not eradicated disease. We have not eliminated mistakes. We have not erased social inequities. Read about the people who are dedicating their lives to making things better. It will make you want to be better as well. Highly recommended to health care professionals and patients alike. Several chapters of this book appeared first as articles in periodicals. Though the book follows a fascinating theme, do not expect it to be as well-integrated as Complications: A Surgeon's Notes on an Imperfect Science. The overall message is the dialectic between strict adherence to practices known to work (hand-washing) and an inspired ingenuity. How to achieve both? There is much interesting material here: the WHO campaign to eliminate polio, the history of Cesarian sections in obstetrics, the ethics of assisting in the death chamber, the story behind longer life span for cystic fibrosis patients. These and other chapters are tied together by the quest for improvement of outcomes. The afterword encapsulates Dr. Gawande's advice to medical students on making a difference in people's lives, and it alone is worth the price of the book. "It often seems safest to do what everyone else is doing ..." he writes in closing. "But a doctor must not let that happen--nor should anyone who takes on risk and responsibility in society." Altogether this is an informative and thought-provoking book with lessons that go beyond the specifics of medical practice.